But how do you take revenge against the most powerful man on the planet? 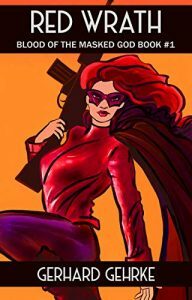 Filled with action and adventure, Red Wrath is a dark superhero thriller which will keep you turning the page! Red Wrath began with the idea of a young girl needing to get payback against someone with abilities close to Superman’s with no powers of her own. As I began to flesh my main character Lily out during my outlining, I discovered an angry young woman who had slipped so far down the rabbit hole of revenge that I knew I had to explore her story and write it. The characters that live in Red Wrath’s world are a speculation of what a group of low powered heroes and villains would be like if they lived in our world, with the added complication that some of them are secretly immortal. Some of the gifted individuals have lived among humans for centuries, and their origin and relationships and the mystery of how they came to Earth makes up the core drama of the series. The main character Lily finds companionship with an equally revenge-minded obsessive man who has also lost himself to hating the heroes that claim to do good. "You weren’t expecting me to show up in your life, get you drunk, and then reveal a crazy plan to assassinate the most powerful superhero on the planet. It does sound crazy. "But it also might work. "I’m not asking anything from you except that you keep this to yourself."